Don't stay in this year. See 2016 out with a bang! It’s time to ring in the New Year, so why not make it fun? Join recent Food Network "Chopped" champion Demetrio Zavala at Declaration in the Shaw neighborhood for two New Year’s Eve menus. A 3-course meal will cost you $35 while a 4-course meal will run $45. Teddy & the Bully Bar is offering dining, entertainment, party favors and a champagne toast during its New Year's Eve event. Guests can enjoy a 5-course meal for $50 or a 6-course meal for $70. Slate’s 5-course meal is $60, plus an additional $30 for wine pairings. Reservations at the Glover Park restaurant are available starting at 5 p.m.
Savor unlimited plates of Ambar's signature Balkan cuisine as you ring in the new year. The restaurant, located on 8th Street in Southeast, offers three different seating options, ranging in price from $69 to $99. Lincoln restaurant on Vermont Avenue NW, the sister restaurant to Teddy & the Bully Bar, will also be offering dining and entertainment for $70 per person. Whaley’s in Southeast D.C. is offering a 4-course meal for $75 on New Year’s Eve. Guests can enjoy the seafood-packed menu as they celebrate the new year. If Indian food is your favorite, try Rastika for New Year’s Eve. The restaurant has two locations in D.C.-- one on D Street NW and one on New Hampshire Avenue NW. The restaurant's special NYE dinner costs $85. If you’re looking for unlimited tapas and drinks, Boqueria is the place for you. Earlier seating is $90 per person and later seating is $135 per person. Feeling French? Enjoy a dinner straight from southern France at Georgetown’s Chez Billy Sud. The three course meal costs $95 per person. Meat lovers will appreciate the carnivorous selection at DBGB on H Street NW. The NYE gala menu begins at 7:30 and costs $95 for four courses. Sample the flavors of Latin America with Del Campo's New Year's tasting menu. The special dinner at the downtown restaurant costs $110 per person. Countdown to 2017 with a 5-course chef’s tasting menu at wine-centric Proof on G Street NW. Dinner costs $125 per person or $195 with wine pairings. Celebrate 2017 with award-winning chef Fabio Trabocchi's "Decadence Menu of Celebration" at the sophisticated Fiola restuarant on Pennsylvania Avenue NW. Four courses and dessert cost $175. It's a splurge, but Minibar on E Street NW is one of the top rated restaurants in D.C.-- it's got two Michelin starts. Chef Jose Andres' NYE dinner will set you back between $300 and $550. This party won’t break the bank with a $25 admission fee (although there’s no open bar). You can catch deals on food and drink, however, from 8-10 p.m. The party will go down at Brixton on U Street. For $30, you can dance the night away at The Black Cat on 14th Street NW. Performer Peaches O'Dell and her Orchestra will be rocking out as the clock strikes midnight. Feeling nostalgic? Throw it back to the 90s at the Mellow Mushroom in Adams Morgan and enjoy dancing, a champagne toast, appetizers and more. Tickets start at $35. Take an exotic trip to Cuba over New Year’s Eve-- well, almost. Cuba Libre is ringing in the new year with a Cuba themed bash. Regular admission is $35. Want to enjoy an open bar? That will cost you $100. Throw on a pair of wireless headphones and dance to your own beat at this silent disco at the Embassy Row Hotel. Included in your ticket are headphone rentals and a complimentary sparkling wine toast. Additional drinks and food are available for purchase. Ticket prices range from $40 to $50. If you’re looking for a shindig in Arlington, check out the party at A-Town Bar and Grill. The $42 admission will get you three drinks and party favors at this masked costume celebration. Enjoy a Parisian evening at the Malmaison DC in Georgetown. The evening includes a DJ, a one-hour open bar and a midnight champagne toast. Tickets start at $50. Celebrate St. Patty’s a little early-- Kelly’s Irish Times near Union Station is throwing an Irish themed New Year’s bash. Tickets start at $53 for this open-bar party. Join D.C. art group Art Soiree for their New Year’s Eve gala at The Graham Georgetown. Eat, drink and be merry atop the rooftop bar-- don’t worry, it will be heated and covered. Tickets start at $75, but you can snag limited earlybird tickets for $50. Be transported back to the 1920s and dance the night away to a live jazz band at Ri Ra Georgetown. Guests are encouraged to come in costume, with prizes for the best period costume. Ticket prices range from $90 to $120. Joonburg.com will be hosting their 6th annual downtown countdown at the Washington Hilton. The event will include an open bar, buffet and performances by Bowling for Soup, EC Twins, the Rockets and more. Tickets start at $99. Travel around the world with the International Club’s New Year’s Eve gala. Each ballroom at the Marriott Marquis will represent a different destination. Guests can enjoy live entertainment, an open bar and dining. Tickets start at $105. Turn into a secret agent for the 15th annual International SPY Gala on New Year’s Eve. Dress in your best spy-themed ensemble and enjoy a buffet, drinks, balloon drops, dancing and more. Tickets prices range from $109 to $400. Come down to the Georgetown waterfront for a riverside bash. The event includes live music, appetizers and open bars. Tickets are $110, with $10 off for groups of 10 or more. Held at a secret location, this party is a nod to bygone days of flappers, speakeasies and bootleg debauchery. Tickets for this glamorous celebration start at $115. 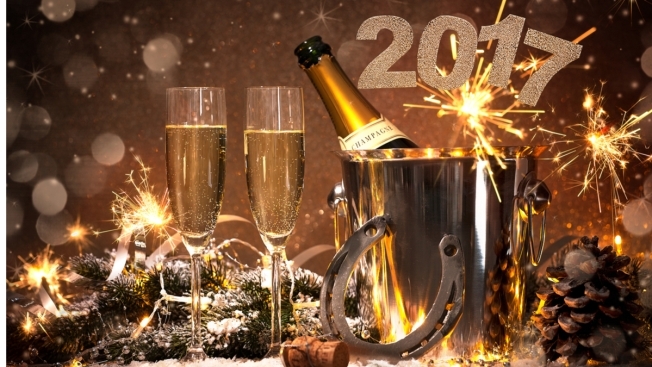 Spend your New Year's Eve at the Gaylord Hotel and Resort for their Big Night DC. Their party this year includes dance floors, bars and a midnight countdown. Ticket prices range from $119 to $340. Join Drink the District for a cocktail extravaganza at the Mead Center. Take advantage of the open bar and try a new signature cocktail every hour. Keep your stomach lined with food from the dinner buffet or mix things up with a hand-rolled cigar from the cigar bar. Dine, drink and party with a live DJ at the Watergate Hotel. The New Year’s Eve countdown will be televised at the event. Tickets are $160. The W in Washington, D.C., invites you back to the 1920s for their New Year’s Eve party. Guests can dine at either POV or Pinea Restaurant, enjoy an open bar and dance the Charleston. Tickets are $299 per person. Dress in your best upscale attire, gather your crew and enjoy an open bar and hors d’oeuvres at Bar 7. Tickets prices range from $400 to $1500 for groups ranging for four to 15 people. If the little ones can’t stay up for the real ball drop, count down with them at noon on Saturday at The Yards DC. Admission is free. There will be face painting, crafts, inflatables and a balloon drop. Bring the whole family for a night of local entertainment, activities for the kidsand fireworks over the Potomac in Alexandria. It’s $30 per adult and free for kids under 12. Enjoy a night of entertainment in downtown Falls Church with the whole family. There will be food trucks, live performances, obstacle courses, balloon artists and more. The event is free and begins at 7 p.m.
Winchester will host their First Night celebration with performances, face painting, crafting, fireworks and more. Buttons are $10 per person and free for kids under 10. Celebrate the end of the year in downtown Fredericksburg. This year’s event will include food, activities and a ping-pong ball drop. Williamsburg, Virginia, will host their First Night for the 24th year. The event this year includes performances, food vendors, fireworks and more. Adult admission buttons are $20 and kid's wristbands are $10. There’s a lot for families to do jat Baltimore’s Inner Harbor. The New Year's Eve Spectacular will include live music, fireworks and ice skating. Don’t worry about getting up early because Dino’s Grotto opens for brunch at noon and serves bottomless brunch at $29 until 4 p.m. Enjoy unlimited mimosas and brunch for $49 in your pajamas at Lincoln. The customer with the best pajamas will get a $100 gift card. Try brunch at the Kingbird at the Watergate Hotel for $110 per person and $55 for kids. You don’t have to change out of your pajamas to go to Medium Rare for brunch on New Year’s Day. Enjoy bottomless mimosas, champagne and a buffet at The Front Page. Brunch will also be served on New Year’s Eve. Start off your New Year on a fresh foot with a locally sourced Italian brunch at Lavagna on 8th Street SE.